We will use this area to keep notes on the bees and provide our customers and friends a place to check up and see how the hives are doing and this spring the bees are doing great. We have successfully overwintered all but one hive. 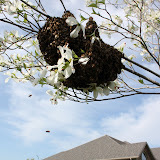 I think the hive we lost actually swarmmed late season. They were full in October, but then a very small cluster in November. Sometimes there is just no pleasing the bees. But, all is not lost in this hive of Itallians, because, the Minnesota Hygenics were doing so well that we split them two weekends ago. Wow, what a blessing to have such and early season strong hive. We put the split in the hive body of the hive we lost, so it is business as usual. This past weekend I removed the entrance reducer and checked the top feeder. They seem to be doing very well. Also this past week we increased our bee yard by 6 hives. A fellow beekeeper took a new job and had to move, so he called me and I bought his hives. 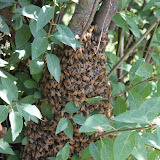 This will ensure a large honey crop for the season. We are very excited to have this fortunate increase. This weekend I will inspect the new hives for the first time. Hopefully we will see lots of brood and stores. Maybe we will even get to split a couple of the new hives.